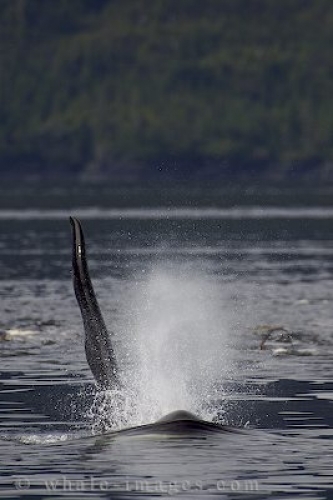 A large male Orca whale is coming up for air beside a whale watching tour in Johnstone Strait in British Columbia, Canada. One of the best spots to go whale watching for Orca Whales is Johnstone Strait off Northern Vancouver Island. There are several whale watching tours offered. The most popular ones are leaving from Telegraph Cove with British Columbia's 1st whale watching company.